The iPhone 3GS has been sold out Just two days after the the phone’s release in Saudi Arabia by Mobily. Mobily claims that new stock will arrive after Eid (27th of November). People who reserved an iPhone 3GS will not be able to purchase it any time soon. Many readers have expressed their frustration to us using Twitter and Facebook. According to Yousef‘s post: One of the main Mobily showrooms in Jeddah only had 700 iPhones, some branches had only 200-300 and the branch that he went to only had 50 iPhones. Mobily is now waiting for new stock provided by Etisalat in UAE. 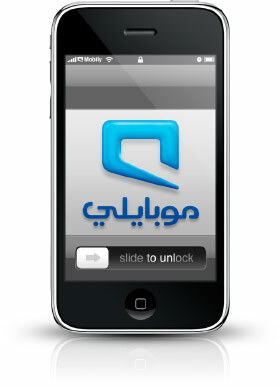 Mobily’s iPhone page still claims that the iPhone 3GS is available now. Many customers are wasting their time going to a Mobily store based on that web page only to find out that there are no more iPhones available. Apple has created an iPhone 3GS availability page for their stores, why can’t Mobily do that? On a related note: last time with the iPhone 3G Mobily announced that over 25,000 people “reserved” an iPhone 3G. They announced that only 1 day after the release date, however with the iPhone 3GS Mobily did not announce their sales numbers. It should be before EID However at least they are getting the new stock after EID. Mobily better keep their word or else. Poor service is the reason why i got mine from Dubai. It was cheaper and painless to buy it from there. All the best guys…… That’s why I got mine on the launch day itself…..
last nyt I went to izone just beside the mobily in thalia and there’s an iphone being sold there and it cost 5000 SAR.. it’s expensive.is it a fair price? no it is not a fair price. thanks for the reply.. btw, when will the iphone be available again? may i knw the exact date? 🙂 thanks again..
Another iPhone on the way? OF COURSE ANOTHER iPHONE IS ON THE WAY !!!! Come on guys, Apple introduces a new iPhone every summer at the WDCC in California. Just like they did for the 3G and most recently 3GS. It probably will be available in the US in June/July of 2010 but it will reach us August-November 2010 (just like the 3GS). hey guys any news on the new stock yet? Mobily people themselves even don’t know about the new stock.. They are playing wid the customers.. on each visit, they are giving new dates, as prisoners are given new date for hearing. Getting frustrated by thier extremely non-professional behaviour… Apple should re-think about thier KSA partner, else people will always b cursing…. claims it’s available now and it is a lie. I did e-mail theme… no replies until now… only confirmation that they have transfered it to the concerned party and it will be dealt with as soon as possible. Hi, Khaled, you are really excellent, thanks a lot for your time to writing down, I cant stop appreciating you for being so clear…. keep it up..
What an EPIC fail, isn’t it ? Im planning to move from iphone 3G to 3GS. Please advise how can I erase all data from existing 3G and have it all the way in my 3GS using itunes. Thanks. I will purchase 3GS and then erase all contents of 3G and then I can restore backup of 3G from itunes to 3GS. Ok, so which mobily store in Riyadh has 3GS, nearly Sahara mall? that’s where I purchased my 3G. I’m about to come to Riyadh in two weeks! Guys please help me! Tell me how much will I need to pay for iPhone 3GS in MacStore??? How much will I need to pay additionally to that price for prepared package? will I need to pay only that price? Or there will be needed additional charges??? Get the prepaid plan. it gives you a SIM card and 6 months of 250MB free each. Just keep the SIM card for activation. What does “activation” mean? Will I be able to throw away Mobility’s sim card and use my one? activating for the first time. What can happen if I loose Mobility SIM card? how muchis the iphone 3gs 16 gb now????? how much is the iphone 3gs 16 gb now???? When will the iphone 4g be released here in Saudi Arabia?, how much will it be?, thanks….